Firstly I thank the author for sending across a copy of the book for review. This is a debut novel from author Rahul Rai. It is based on Mahabharata. I am a fan of Indian Mythology and esp. Mahabharata. Mahabharata is a kind of epic which you can read and re-read numerous times. Still you won't feel satiated with the knowledge pearls showered on you. I am always curious to know more about it. I have read various versions of this epic from the perspective of various characters. Also, I've read a lot of online material about facts and myths of the epic. I have watched a dozen of TV shows on this greatest epic of our history. Whenever a story is told and retold, it eventually gets modified based on the perspective of the story teller. This makes it even more interesting. Mahabharata is one such story. The feat of the great war of its time, was it justified? The whole clan gets ruined by the end of it, except for a handful of people who very lucky to survive. How is this book different from other versions of Mahabharata? Unlike other versions, the author simplifies and segregates the epic is multiple chapters. The illustrations at the beginning of each chapter are very good. At various points it is more of an analysis of the epic, the conclusions drawn out of various events and what could have happened instead. One great thing is that it has various narrations or conversations of such characters which were never even thought of having existed. Like, conversations between soldiers fighting from separate parties but friends in personal life, maids working at Hastinapur palace, etc. You also find Bhishma and Ved Vyas pondering over their mistakes. You see Duryodhana talking about dharma. I always knew about Ashwatthama but never knew about him in such detailed manner as depicted in this book. Drona and Drupad's enemity is known to all those who know Mahabharata, but very few know about their friendship and how it transformed them into blood mongers for each other. People know Pandavas as one entity, or know the famous ones- Yudhishitir, Bheema and Arjuna. Hardly anyone talks about Nakul and Sahadev and their story. We never talk or read about their qualities, their relationship with their step brothers and the insecurities that their maternal uncle had for them. This book talks about their testimonies too. The injustice that happened with Hidimba and her clan for no fault if theirs. The sacrifice they made by being mere pawns in the war between the Hastinapur family. The story of Krishna's son Samba and the doom of Yadava's kingdom was less heard of. Remember, each character in a story has his own story too. This books succeeds in narrating stories of a lot of such characters who have been sidelined in the history. Although, like I mentioned there are various versions of Mahabharata and that, each version narrates events in its way. Hence, the facts are often intentionally or unintentionally tampered when they reach us. They are affected by the knowledge, perspective or research of the story teller. Same is the case with this book. Since I have read various versions, I find certain deviations here, but that is what I call story telling. That is why they call it "myth" or "mythology"! 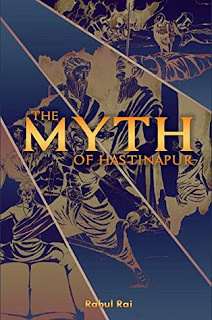 To read and understand this book, you must be having some prior knowledge of Mahabharata. This is because, the style of narration is not sequential in terms of the order of the events, which may confuse someone who does not know about it. However, the chapters are segregated in interesting and logical manner. Such way of narration also shows up the hard work that the author has put in and this does not let you put down the book throughout. The language is pretty good, usage of words and grammar are very well. Overall, I like the book and would make sure I read it once more. I recommend it for all those who have interest in Indian mythology and want to dive into various aspects and perspectives of it. I rate it 4 on 5.